Dementia is a condition which tends to affect older people. There are four main types – Alzheimer’s disease, vascular dementia, lewy body dementia and frontotemporal dementia. General symptoms of dementia include memory loss, problems with mental sharpness and quickness and a temperamental mood. 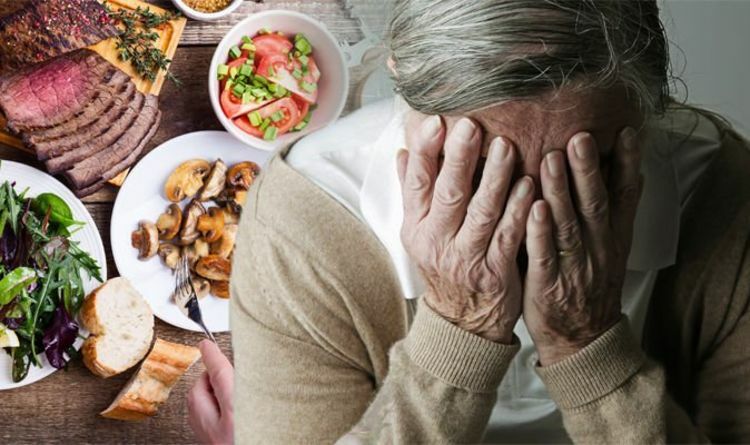 While scientists are still working on a way to prevent dementia developing, there are things you can start doing now to prevent it, such as changes to your diet. A healthy balanced diet including lots of fruit and vegetables, is recommended by Alzheimer’s Society. The dementia charity adds: “Aim for five portions a day, Fresh, frozen and tinned fruit and vegetables all count. “A healthy diet also has fish at least twice a week, including oily fish (e.g. mackerel, salmon, sardines) which contains healthy polyunsaturated (omega-3) fatty acids and vitamin D.
The Mediterranean diet is the recommended diet to prevent dementia. It adds: “ Following a ‘Mediterranean’ kind of diet is good for your cardiovascular health and may reduce your dementia risk. “This diet is high in vegetables, fruit and cereals. “Fats are mainly unsaturated (eg olive oil) with very little saturated fat (eg cakes, biscuits, butter, most cheeses). But what foods should you avoid? As part of a healthy balanced diet you should limit sugar treats and keep an eye on your salt intake.